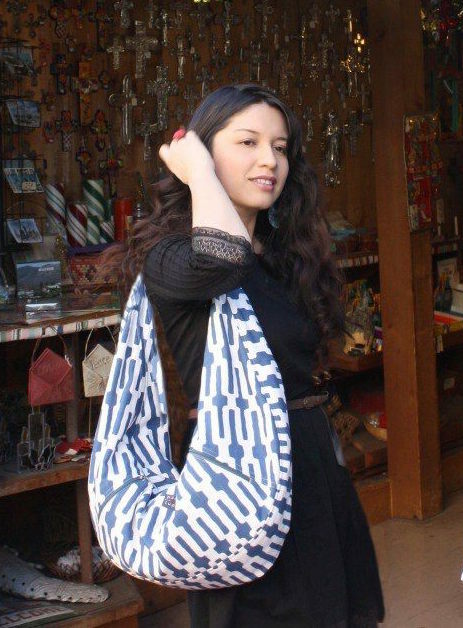 BOHO MARKET: Lovely Guest Blogger: Rachael from It's Simple Love! Lovely Guest Blogger: Rachael from It's Simple Love! Hi! My name is Rachael from It's Simple Love. First off, I want to thank Giovanna for asking me to guest post on her fabulous blog. It is an honor! I have been following Boho Market for about a year now and it continues to inspire me daily. I find Giovanna's style tasteful and classy yet modern and fun. I am flattered to share a little of my taste with you today! 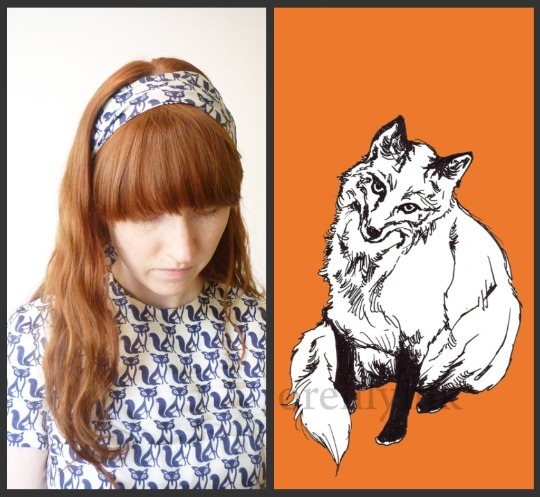 Today I wanted to share my fascination of foxy fox fashion. I have seen these furry creatures make their way into jewelry, home decor, clothing, and more! And I have to say I welcome the little critters. 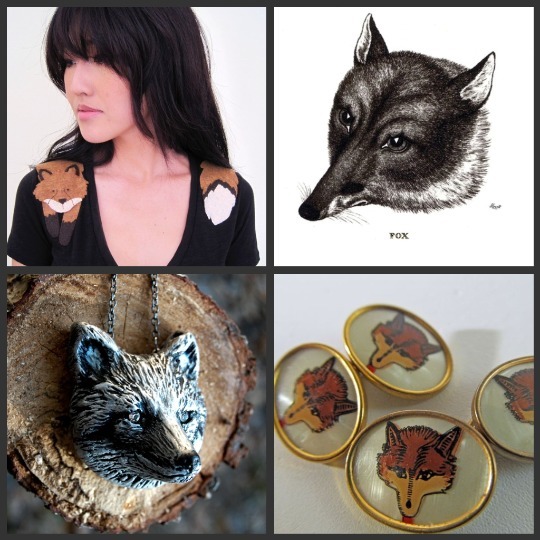 I chose some of my favorite swoon-worthy fox items from etsy to share with you today. Though as you very well know animal print in the fashion industry is not a new phenomenon (take the 60's fox print dress pictured above). Men and women alike have adorned their clothing with animal prints for decades. So tell me, what animal would you sport around on your sleeve or as home decor? Hola! Mi nombre es Rachael del blog It's simple love. Primero, le quería agradecer a Giovanna por permitirme escribir en su blog, para mi es un honor! Vengo siguiendo Boho Market hace mas de un año y continua siendo una fuente de inspiración diaria para mi. Encuentro el estilo de Giovanna muy lindo, clásico pero a la vez alegre y moderno. Me siento muy halagada por poder compartir con ustedes un poco de mi estilo! Quería compartir con ustedes hoy mi fascinación por los detalles de animales, en este caso el zorro. Me he dado cuenta como estas lindas criaturas poco a poco han formado parte la moda, la joyería, la decoración, etc. Y tengo que decir que me encantan! Escogí mis piezas favoritas en Etsy.com que están inspiradas en esta tendencia. Es cierto que el print de animales no es algo nuevo en la industria de la moda (por ejemplo el vestido vintage de los anos 60 de la foto de arriba). Hombres y mujeres han adornado sus ropas con prints de animales por décadas. Me gustaría saber que animal les fascina y utilizarían como inspiración ya sea en sus outfits o en decoración? rachael i love your cute selections! The fox is fab, I love owls best. I love birds too! Cute pictures and nice post!! Muito Bonito Continua deste modo !! Her blog is super cute! I love this post and your blog as well! i absolutely love foxes. they always look so chic. Beautiful work and inspiration. The fow is a fantastic creature for inspiring..